MP3 Speed è un programma facile e gratuito per modificare la velocità dei file mp3. E' possibile modificare il ritmo di una canzone aumentando la velocità o riducendola fino ad ottenere una lenta parlata. L'interfaccia semplice e chiara, semplifica l'utilizzo del programma anche per i meno esperti. MP3 Speed è veloce nella conversione ed è completamente ottimizzato per multiprocessore e sistemi multi-core. 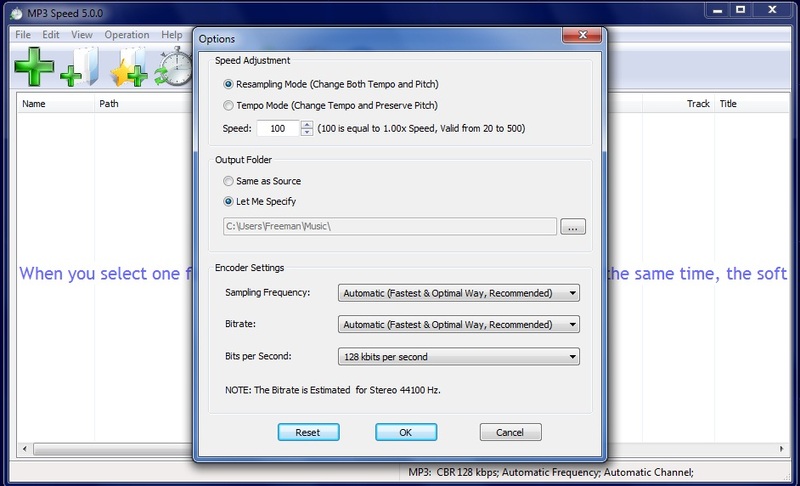 •MP3 Speed is a freeware which changes the speed of mp3 files. •Modify MP3 speed changing both tempo and pitch. •Modify MP3 speed without changing pitch. •Speed up audiobook to save drive size and listening time. •Slow down MP3 file to make the speaking slowly and clealy. •Make your own editions of quickening tempo and slow tempo music. •Incredibly fast and fully optimized for multiprocessor/multi-core systems. •On-the-fly converting, no temporary file generated. •Windows Explorer-Style user interface, very easy to use. •Search, add and manage the files to convert with ease. •Build-in latest Lame MP3 encoder which is generally believed as the the best MP3 encoder. •Windows Vista compatible and works with Windows 7 (64-bit and 32-bit).